These items and more are available at both Owenhouse locations. Don’t see what you need? 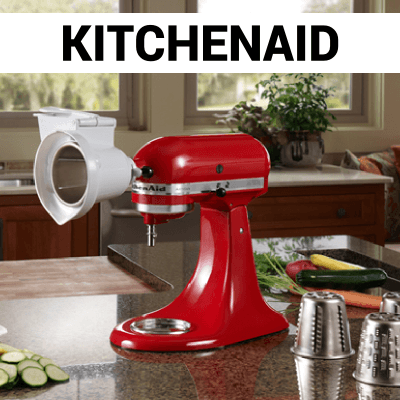 Please ask us about special ordering directly from KitchenAid. 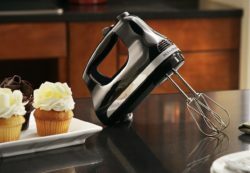 Tilt-head stand mixers offer an efficient way to prepare your favorite cakes, cookies, icing and more. The head raises to easily change accessories, add ingredients or remove the bowl, and then locks back in place. Plus with the optional attachments that fit the power hub, you can make fresh burgers, veggie noodles, homemade pasta and more. Tilt-head stand mixer will quickly become your kitchen’s culinary center as you mix, knead and whip ingredients with ease. Larger capacity stand mixers are designed to help you be more efficient in the kitchen, but KitchenAid bowl-lift stand mixers give you something more. The bowl-lift design makes it convenient to add ingredients while mixing, and the lever smoothly raises and lowers the bowl for more efficient contact between the beater and ingredients. Easily whip up mashed potatoes, mix multiple batches of cookie dough or knead bread dough with our bowl-lift stand mixers. 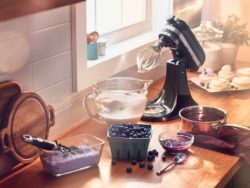 A wide selection of accessories can turn your KitchenAid stand mixer into an essential culinary tool. 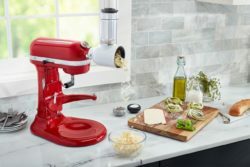 By easily removing the hub and replacing it with one of the accessories, you can grind sausage, roll and cut fresh pasta, puree juices, and even turn your mixer into an ice cream maker. Extra bowls, mixing paddles, whisks, mixer covers, and more are also available so you can get the most out of your KitchenAid stand mixer. Compact and lightweight, the 3.5 Cup Food Chopper is the perfect size for everyday use in the kitchen. Great for quickly chopping ingredients, preparing dressings and sauces, and so much more. The 7 Cup Food Processor features a twist-free design that is easy to use and a sealed work bowl that makes clean-up a breeze. The 9 Cup Food Processor features an innovative design with a one-click, twist-free, bowl assembly and latched lid that is very easy to use & clean. The blade and disc fit inside the bowl to make storage easy. Slice, shred, knead, chop and more quickly and easily. 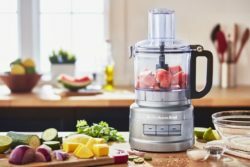 The 11-Cup Food Processor with ExactSlice™ system, slices large amounts of fresh fruits and vegetables from thick to thin with one slide of the lever. This 14-Cup Food Processor features the first, residential, hands-free, commercial-style dicing kit and Exactslice™ System to slice from thick to thin with one slide of the lever. 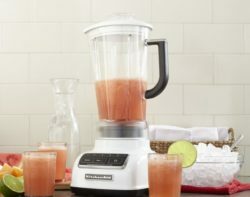 The KitchenAid 5-speed Diamond blender has a robust 0.8 HP motor, unique one-piece BPA-free pitcher, stainless steel blades, and electronic controls. These features create a powerful blender that can handle a variety of creations from soups to beverages and more. You can stir, chop, mix, puree, or liquify with just the right amount of boost: the multi-speed pulse feature allows you to pump up the power on demand at any of the five speed settings, and the ice crush feature easily handles blended drinks and smoothies with its optimal ice-crushing pulse feature. Blend smoothies and soups and quickly with the KitchenAid 2-speed hand blender. Then easily remove the blending arm for easy cleaning. Use the 3 cup BPA free blending jar to blend individual servings that you can enjoy now or save for later with the convenient lid.